Cary, NC – Runners must act now to save up to $20 on registration for the eighth running of the annual Allscripts Tobacco Road Marathon (TRM) and its companion half marathon. On January 1 prices of both the March 17, 2019 events will increase by $10 for the Marathon to $115, and by $5 for the Half at a price of $100. Also, TRM is offering a $10 New Year’s Resolution discount code to help its runners achieve their fitness goals. To encourage people to take action TRM is offering the $10 discount code, NYR2019, which is valid now through January 7. The code applies to either the full or half marathon runs. In addition to discounts, runners can take advantage of training tips at the TRM Web site. Further support can be found through the TRM community on their Facebook page. TRM events are about people helping people. This year TRM will achieve an impressive milestone by exceeding $1,000,000 in charity over just nine years. All proceeds go to these charities: JDRF, Hope For The Warriors, the American Red Cross and the Rails to Trails Conservancy as well as Wake County Parks and Recreation. At the conclusion of the 2018 events, TRM had amassed $916,000 in charitable giving. The races will return to the Carolina pine-lined American Tobacco Trail (ATT) with its flat, fast, granite-screen course in 2019. TRM qualifies up to 18 percent of competitors for the Boston Marathon and was named among the top nine best new marathons by Runner’s World Magazine. TRM is a non-profit organization dedicated to providing financial assistance to charities by channeling the passions of the North Carolina Triangle area’s running community into a powerful force for good. Cary, NC (August 27, 2018) – The board of directors of the Allscripts Tobacco Road Marathon (TRM) and the Feetures Half Marathon will end early bird registration prices on September 1 for their million-dollar milestone races set for March 17, 2019. Runners can save by signing up before then, and join the celebration to mark one million dollars in cumulative charitable giving. Primary beneficiaries are JDRF, American Red Cross, and Hope For The Warriors. Runners can register at the TRM Website. Yahyapour and his board of directors announced at the conclusion of their 2018 event that the races had set a new record of charitable giving at $155,000 – a full $25,000 more than their record-setting year in 2017. They reached a cumulative total of $916,000 in 2018, putting the organization’s goal of $1,000,000 well within reach in 2019. The marathon is the largest in North Carolina, and the only one in the Triangle area during the spring. The Half marathon will also be the only race of its kind in the Triangle during spring 2019. Among the charities receiving contributions from TRM are JDRF, American Red Cross, Hope For The Warriors, Wake County Parks and Recreation, Rex UNC Healthcare Foundation, the V Foundation, Rails to Trails, YMCA, the Food Bank of North Carolina and We Can So You Can. 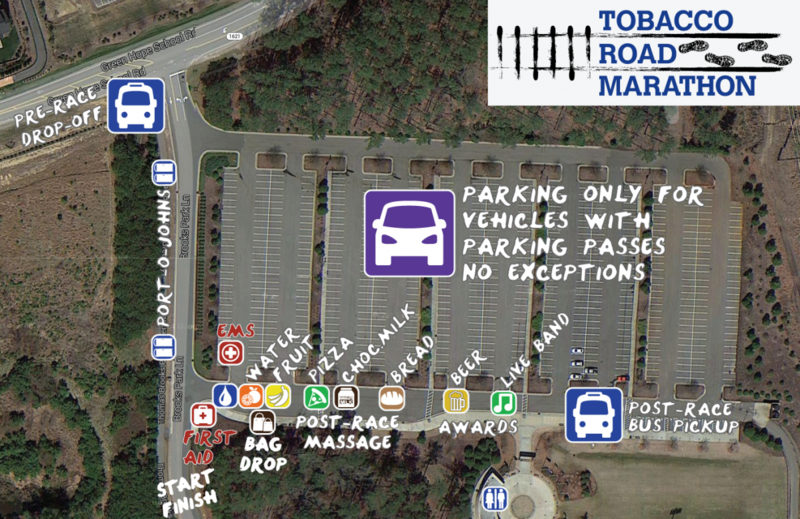 The Tobacco Road Marathon Association is a non-profit organization dedicated with its sponsors to providing financial assistance to its partner charities by channeling the passions of the North Carolina Triangle area’s running community into a powerful force for good. Cary, NC – Runners must act now to save $10 on registration for the tenth running of the annual Allscripts Tobacco Road Marathon (TRM) and its companion Feetures! Half Marathon, both presented by Inside-Out Sports. On July 1 prices of both the March 17, 2019 events will increase by $10 to $85 and $75 respectively. The charitable events will hit a mega milestone in 2019 when they eclipse the million-dollar mark for cumulative charitable giving. The races will return to the Carolina pine-lined American Tobacco Trail (ATT) with its flat, fast, granite-screen course. TRM qualifies 15 percent of competitors for the Boston Marathon and in 2014 was named among the top nine best new marathons by Runner’s World Magazine. All proceeds go to these charities – JDRF, the American Red Cross, Hope For The Warriors, and the Rails to Trails Conservancy as well as Wake County Parks and Recreation. The full and half marathon courses follow the same path for two miles then diverge as full marathon runners head north and those in the half turn south on the ATT. The first two and last two miles of the courses are on paved roads – the rest are on the ATT. The runners will start from the USA Baseball & Thomas Brooks Park in Cary. The course is devoid of hills and the average high temperature for the date (51 degrees Fahrenheit) delivers an ideal performance environment. At Sound the Alarm events, hundreds of Red Cross volunteers, along with fire departments, and community supporters will canvass high-risk neighborhoods, install free smoke alarms, replace batteries in existing alarms, provide home fire safety tips and help families create escape plans. The Red Cross responds to nearly 64,000 disasters a year across the country, the majority of which are home fires. Home fires represent a significant threat to our communities, which is why the Red Cross launched the nationwide Home Fire Campaign that aims to reduce home fire deaths and injuries by 25 percent. Please join this important effort. Together, we can Sound the Alarm about fire safety and help save lives. To sign up to volunteer for Sound the Alarm, or to learn more, visit soundthealarm.org/enc. Sound the Alarm is made possible thanks to generous financial donations from national partners: Almost Family, Delta Air Lines and International Paper. The Red Cross has also received funding from FEMA through the Assistance to Firefighters Grant Program. Local supporters include Blue Cross and Blue Shield of North Carolina, Circle K, CBS17, Duke Energy, Wells Fargo, New Hanover Regional Medical Center, Live Oak Bank, Smithfield, and United Way. PHOTO: North Carolina Red Cross volunteers prepare to install smoke alarms in neighborhood homes. Photo by Adam Jennings/American Red Cross. Photo by Adam Jennings/American Red Cross.